I didn't have much to show in the meeting as the last time I worked on a quilt was in January and I'm not exactly the most talented quilter of the group anyway. The other ladies brought some pretty impressive stuff with them though. Muriel (top right) brought a Pippi Longstocking quilt top she and other quilters made in the Cocorico Patchwork Bee. Fabulous theme and all the blocks were so well executed and original. You can check out this and other wonderful patchwork projects in the Cocorico Bee Flickr Group. Lotje made the 'Everything but the kitchen sink' (which I just found out is actually called 'Funky Garden') quilt on the left which consists of a delightful random collection of different quilt blocks. 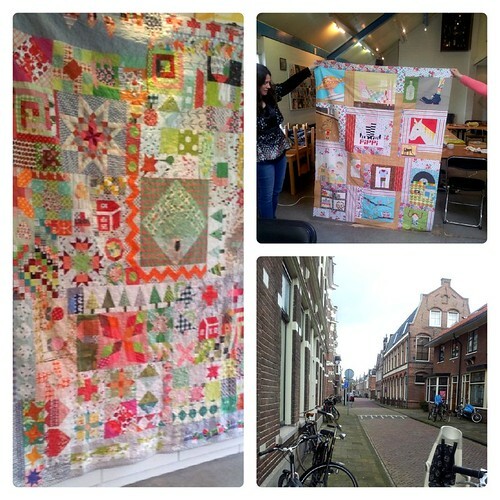 There was so much to see and admire and we all felt really inspired by Lotje's quilt. So there and then we decided to start a Double Dutch Quilt Along to make a similar (yet different) quilt for ourselves. Everyone is welcome to join in and details will be announced soon! I am no great quilter and those I do are made of scraps so don't generally have a theme. Love those you have shown though. What talented sewers they are. Love quilts that are scrappy and so colorful. Always so nice to spend time with other creative people, sounds like you had a nice day! It was a lovely day - and any random sampler I make next will be 'everything but the kitchen sink', it's a really good name! !